DOES raising taxes on those who are doing well economically stifle growth and slow down the recovery? That depends on how rich people behave when their taxes rise. Do they work less when they are allowed to keep a smaller chunk of their income? Do they move their money offshore? Do they take a larger share of their earnings in forms that are more lightly taxed? Economists have looked at the effects of many past changes in tax rates to try to answer such questions. Martin Feldstein, a Harvard economist, found that the taxable income of the rich adjusted dollar-for-dollar with tax rates when America cut its highest tax rate from 50% to 28% in 1986, so that tax revenues stayed the same. This would suggest that raising top tax rates is likely to produce little extra revenue, while distorting economic behaviour further. But others have found that this adjustment in taxable income is driven largely by people altering when and how they take their income in order to minimise their tax burden. 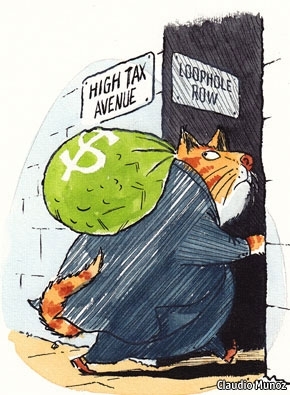 For instance, there was a big fall in taxable income after tax rates rose in 1993; but most of this seems to have come from a few rich people hurrying to cash in their stock options before taxes rose. Thomas Piketty of the Paris School of Economics, Emmanuel Saez of the University of California, Berkeley, and Stefanie Stantcheva of MIT argue in a new paper that this is why few studies have been able to show any significant long-term effect from raising top tax rates. But such avoidance, they say, is merely a symptom of a poorly designed tax system. It is silly to have a high tax rate while simultaneously giving people many ways to avoid paying it. So the first task of tax reformers must be to minimise such opportunities by having a broader tax base, better enforcement and similar tax rates for different kinds of income. That is relatively uncontroversial. But their other finding is likely to raise a few eyebrows. They reckon that if the tax system were reformed to make evasion impossible, the top tax rate might be able to rise to as much as 83%—that is, to levels last seen in the 1960s—without hurting the economy. This is because people do not seem greatly to adjust how much they work when tax rates change. Higher top rates may also discourage big earners from spending too much of their time trying to bargain for a larger share of the overall pie. Now all that remains is to remove the loopholes. On past experience, America’s rich need not lose sleep over that.